Mariner East 2 and 3 would be a set of two 24-inch pipelines which would begin in Scio, Ohio and end at the Marcus Hook refinery near Philadelphia. These pipelines would cross 350 miles, and 17 counties, in Pennsylvania, and carry approximately 770,000 barrels of natural gas liquids daily across Pennsylvania. § 27. Natural resources and the public estate. Unfortunately, this right of the people is under assault from both fracking and pipeline construction. The project with which my family and I have the most experience is the Mariner East 2 and 3 Pipeline Projects, aka the Pennsylvania Pipeline Project. Sunoco Logistics (SL), the owner/operator of both the existing Mariner East 1 and the proposed Mariner East 2 and 3, is a subsidiary of Energy Transfer Partners, based out of Dallas, TX. Mariner East 2 and 3 would be a set of two 24-inch pipelines which would begin in Scio, Ohio and end at the Marcus Hook refinery near Philadelphia. These pipelines would cross 350 miles, and 17 counties, in Pennsylvania, and carry approximately 770,000 barrels of natural gas liquids daily across Pennsylvania. The product that would be carried by ME2/3 is a highly pressurized combination of propane, ethane, and butane. These odorless, colorless, and highly volatile gases are compressed into liquid form for transportation. Should there be a break or a leak in the pipeline, these NGLs would convert back to their gaseous states. These gases are heavier than the air, meaning that they would not just disperse into the atmosphere, but would flow to the lowest point. The high volatility and size of the pipes have the potential to create a blast radius of 3 miles. So, this is the pipeline and company that my family has been fighting in Huntingdon County since February of 2015. After thirty years of teaching special education students, I was looking forward to spending time with my family, gardening, sewing, reading, etc., all the things that I love and now would have more time to enjoy. Sadly, that would not be the case. Two years ago, in February of 2015, we were notified that Sunoco Logistics would be putting part of the Mariner East 2/3 through approximately 3 acres of our property. Unfortunately, these three acres include our pond, streams, wetlands, and a steep, forested slope next to the pond. We turned down their offer and refused to sign an easement agreement. In August 2015, we were notified that Sunoco Logistics had filed for eminent domain in the Huntingdon County Court. Sunoco Logistics argued that, by virtue of a public convenience certificate issued in the 1930s for the Mariner East 1, they had already been granted public utility status. This was despite the fact that the ME1 was originally designed to carry petroleum products from east to west, and now both the ME1 and the ME2 would be carrying natural gas liquids (NGL) west to east---a totally different product transported in a totally different direction. Sunoco Logistics also argued that this pipeline project would provide both a public benefit and numerous jobs for Pennsylvania citizens. In January 2016, Huntingdon County judge George Zanic granted Sunoco Logistics’ request for eminent domain. This ruling was immediately appealed and is currently in Commonwealth Court. Despite the fact that the Pennsylvania Department of Environmental Protection had not yet issued water crossing and soil erosion management permits, the favorable eminent domain ruling gave SL permission to survey and ultimately clear-cut on our property, although they could not begin any construction until DEP issued water-crossing and soil erosion permits. In March 2016, Sunoco Logistics requested, and was granted, an injunction prohibiting us from interfering with SL’s surveying and clear-cutting. The company claimed that they would “suffer irreparable harm” if they could not clear-cut by March 31. They cited the Migratory Bird Act and the brown bat nesting season as reasons why they could not clear-cut after that date. On March 29, Sunoco Logistics, accompanied by the Huntingdon County sheriff’s department, began clear-cutting trees around the pond, wetlands, streams, and hillside. A group of about 12 observers were there to document the cutting. There were also 3 people who had established themselves in “tree-sits”. At one point, sheriff’s deputies arrested two of the observers and charged them with “summary disorderly conduct, misdemeanor disorderly conduct, and indirect contempt of court.” During their arraignment on these minor charges, they had their bails set at $200,00 and $100,000. The next day, while trying to draw the deputies’ attention to the fact that the tree clearers were cutting too close to one of the sitter’s trees, I was arrested on the same charges. I was released on $5,000 bail. The tree cutting crew left at mid-day on the 30th and did not return. 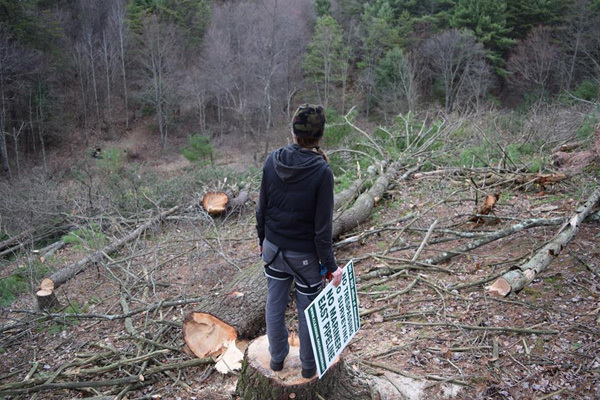 Elise Gerhart, Ellen’s daughter, surveying the trees that Sunoco cut in March, 2016, without their permission. In April 2016, the Sunoco tree crew returned to finish clear-cutting, even though it was more than a week after the date cited in their injunction. I was again arrested. This time I spent 3 days in the Centre County Correctional Facility because Huntingdon County has no accommodations for female prisoners. I was held on “suicide watch” because I refused to answer intake questions. I was denied phone calls to either my family or my lawyer. I was finally released on $5000 bail. From April 2016 to December 2016, those of us who refused to take the Accelerated Rehabilitative Disposition plea (primarily used for those facing DUI or drug charges) had to appear in Huntingdon County court for various hearings. Finally a trial date was set for December 9, 2016. Three days prior to trial, DA Smith announced that all charges would be dropped, because the “disorderly conduct” occurred on private property and they couldn’t prosecute. What has been the most frustrating part of all of this is the failure of various agencies, in particular, DEP, to actually protect the environment. From the beginning of this ordeal, we asked DEP, DCNR, Fish and Wildlife, the Army Corps of Engineers, and Governor Wolf to uphold the environmental protection guaranteed in the Pennsylvania Constitution. In its three permit application attempts to DEP, Sunoco failed to rectify numerous deficiencies on just our 3 acres, let alone the rest of the 350 miles of proposed pipeline. We hired an independent environmental consultant who found that Sunoco had listed only half of the streams and one-seventh of the wetlands area that would be impacted by the installation of the pipeline. Sunoco mislabeled our forested wetlands as emergent wetlands. They also failed to do an onsite analysis of soil composition, an onsite inventory of flora (including tree species), or an onsite inventory of fauna on their first two permit application attempts, and still mislabeled species. No one from DEP came to verify Sunoco’s analyses for the permits until after the initial tree-clearing had taken place, despite several requests from us. Sunoco continues to file permit applications that contain unresolved deficiency issues. It is currently on its third attempt to have DEP grant the permits which would allow construction to begin. Unlike the previous two applications, it appears that DEP is not going to allow public hearings or public comment on the matter, although the agency has had at least four meetings with Sunoco in the past two months. This is a clear bias in favor of Sunoco Logistics. Once DEP issues permits, Sunoco can begin construction, even though several eminent domain cases, including ours, are still pending in Commonwealth Court. We demand a public participation process be established for Sunoco Logistics' resubmitted application for 105 and 102 permits for Mariner East II. The public is being disenfranchised while Sunoco has advance information about DEP actions. The process is being manipulated to Sunoco's advantage at the expense of private landowners. We want a comment period of at least 60 days, hearings scheduled across the state, and an inclement weather plan so the most people can be heard. The public has a right to review and comment on matters that impact us as adversely as the Mariner East does. We don't need any more pipelines. Do the right thing. Deny the 105 and 102 permits. For contact, more info and updates visit the Juniata Watershed People Before Pipelines page on Facebook. For help with our legal battle, visit our page on the Energy Justice website. We are very disappointed that the Pennsylvania Department of Environmental Protection (DEP) is not living up to its name. DEP issued Chapter 102 and 105 permits to Sunoco Logistics for its Mariner East 2 project on Monday, February 13, for water crossings and soil erosion control management. Permits were issued despite inaccuracies and deficiencies. DEP officials met with Sunoco on at least four occasions to review the latest applications, yet refused to set up public hearings or extend the public comment period. The fight is not over. Clean Air Council, Mountain Watershed Association, and Delaware River Keepers have filed a suit in Commonwealth Court to stop this project. West Goshen Township has denied permission for the pipeline based on violations of municipal codes. Several eminent domain cases, including ours, are still in appeal. The Army Corps of Engineers has not yet issued all necessary approvals for the project. Unfortunately, Mariner East 2 is not the only pipeline planned for Pennsylvania. The Atlantic Sunrise and the Penn East in the eastern part of the state were also granted permits. Shell Corporation is planning the 93-mile Falcon pipeline in western Pennsylvania to supply its ethane cracker plant now under construction. People are still suffering from drinking water pollution caused by fracking. Government officials need to hear, loud and clear, that the citizens of Pennsylvania oppose this. Permissible to copy and post? As long as you link back and credit the author (in this case, Ellen Gerhart), I think you're welcome to share anything on the site. Thanks for asking.